Children’s author Melinda Szymanik posted this on her blog this morning, and I immediately wanted to repost it. Melinda is the author of many wonderful books, most recently Fuzzy Doodle, illustrated by Donovan Bixley, which is still in my top 10 children’s books for this year. My parents were immigrants. World War 2 pushed them out of their home country Poland and brought them, via a truly circuitous route, to New Zealand. I was born here about seven years after their arrival. My Polish heritage informed so much of my early life. The food we ate, the people we socialised with, the traditional folk dancing I learned, the national costume I owned and sometimes wore. To my regret, I didn’t learn the language. In my tender years I didn’t appreciate the value of doing so. I found it hard. And I eagerly embraced the language of my peers (I love the English language. We are always doing gymnastics together). But at school I enjoyed having this exotic Eastern European background. I was the only Polish kid in class. It felt special. So I wore it with pride. I was a booky kid. I read a lot in school right from the beginning. I hung out at libraries all the time. The Lion,The Witch and The Wardrobe (although I started with The Silver Chair after picking up the hardback for a bargain price at a school fair), The Famous Five, Paddington Bear, The Moomintrolls, Baron Munchausen, The Moon in the Cloud, The Wolves of Willoughby Chase, Little House on the Prairie, Nancy Drew, Trixie Belden, The Hardy Boys, The Hobbit, The Weirdstone of Brisingamen, Flambards, The Outsiders, A Wizard of Earthsea, The Dark is Rising, Fairy Tales, The Odyssey, Robin Hood, King Arthur and the Knights of the Round Table and many, many, many more. Are you sensing a theme to my reading yet? The only New Zealand literature I was exposed to as a child was what the School Journal provided. There was no Margaret Mahy or Joy Cowley, Maurice Gee, Fleur Beale or David Hill back then. I read one short story by Witi Ihimaera and didn’t understand it at all, because it was a single drop in a vast ocean of the European and US literary heritage I was consuming in vast quantities. It became difficult to sustain the atmosphere of Polishness as we all grew up. We had to get on with our Kiwi lives. We didn’t forget but wore it more on the inside than the outside. And the pre-war Poland of my parent’s experience was unreachable, existing in memory but no longer in reality. And my empathy and understanding of people and the world learned through books filtered everything through a foreign lens. What is it to be a New Zealander? I’m still figuring it out. I can’t help always feeling a restlessness that can’t be answered, predicated as it is on a nostalgia for a lost heritage that can never be recovered, and a literary education built on cultures to which I can never belong. If you want New Zealand children to understand their own culture, to feel it in their bones, then it must be provided to them in their literature. It helps ground them, makes them feel strong in their roots, connects them to this place and to each other. It reflects their experience back at them, reinforcing its value. We must embrace our own literature. It is a tremendous gift that must be protected and encouraged. We can’t just measure it as a product with sales, because its impact is lifelong, far reaching and life changing. It needs to be everywhere and we need to pay it way more respect then it gets now. Melinda blogs here regularly about children’s writing and other things as they arise. Some great pieces recently include her post on getting through the mid-career doldrums and how to stay sane/hydrated/not-exhausted during launch week. Where are all the Boys in YA? Jo Hogan recently blogged about her concern about the reading habits (or lack thereof!) of her 15-year-old son. He had been a great reader from an early age, but when she took him to a YALC (YA Lit Con) event he was clearly disenchanted and pointed out that it was all about girls and women. I am intrigued by this observation – it was no doubt true of that particular event. But it started me thinking – is it really not about the boys? Not for the boys? My experience as a tertiary, public and school librarian over more than 40 years has given me much to observe. It’s true that many boys – sweeping generalisation alert!! – on the whole prefer to be actively engaged. However it’s not the corollary that we can’t engage them actively in reading for pleasure. It’s more of a challenge for some than for others. To redress that takes time and effort on the part of trusted and enthusiastic readers/role models/parents/teachers/librarians/sports heroes. It’s also true that there is a vast body of material written for and about teenage readers. Equally true, that the range of what constitutes YA material is one of those perennial dilemmas – should we designate particular books as “for” a particular age group? This is something which has happened in relatively recent literary history. When I was a kid, there were children’s books and adult’s books, but there was not anything directed at the teenage market per se. Small wonder then that now kids with access to electronic media 24/7, bombarded by Twitter, active on Reddit, constantly messaging – may find it harder to focus on a sedentary activity which requires full attention. However I believe that many of our boys do just that. They learn to enjoy reading, to be successful at it, and to broaden their reading base by exploring genres, classics, graphic novels and poetry. This does not come easily to a lot of boys. They need care and attention – and feeding! – as they cross the boundary between learning to read and becoming fluent readers. They need male role models – I think many of us underestimate just how important that is. Jo Hogan’s son clearly picked up on that at the YALC event. Although he was (and no doubt continues to be) an able and competent reader, he found it was all a bit girly. Because I don’t agree that it’s not about the boys, I trawled through some website lists of the best YA novels – Time magazine’s top 100 for 2015 has 56 male authors. NPR’s list had 40 out of 100. The Telegraph (I was trying to get a UK perspective) has 9 out of 17 male authors listed in its top reads for 2016. So clearly, there are many male writers who are among the most successful and most appealing to young male readers. In New Zealand, there are some fantastic men working in school libraries, teaching English, blogging about books. It’s probably fair to say there are far fewer men than women, however. I guess this is probably true of most western education systems. But it does not necessarily equate to “it being all about the girls”. My experience in working with boys is that you do have to work harder to find what is appealing. Quirky novels, things that come out of left field a bit, things which resonate with an individual reader – any of these can make a huge difference to a boy who is finding it hard to find the right book. And often it’s that connection between reader and book, right book at the right time, which can help that transition. And yes, it’s important to promote the really good books to our boys. Peer recommendations are a real help here. But there’s another point this young man made – he said that “YA is not a genre, it’s a marketing tool”. He is spot on with that observation, in my opinion. What appeals to teenage boys is not necessarily what has been written with them in mind – and of course there are exceptions! But my personal opinion is that the best writing for young people is not necessarily the result of an author “writing YA books” – it comes from writers who tell a good story, with great characters and a good plot. Good writing transcends artificial age boundaries and stereotypes, and draws the reader in. I think that Jo Hogan should be reassured that the boys are reading, at least in New Zealand. And that her son is also right when he says that his mates don’t read much – in the middle of secondary school years, there is little time for reading for pleasure unless it’s a top priority. But I know many young men who do read for pleasure, regardless of where they are at in their education. They may not read what parents or teachers think they SHOULD read, but at least they are reading. And that, after all, is what matters. Sue Esterman was the Director of Library & Information Services at Scots College in Wellington until 2015. Original story via Flipsnack, reproduced with the permission of the artists. With World Book Day just around the corner, graphic designers Matt Lindley and Jazmin Batisti took eight timeless books, a mixture of children’s titles and classic literature, and stopped to ask themselves the question: what if these stories featured the modern technology we rely on today? What if Juliet had used Tinder to meet her one true love instead? What would Oliver Twist’s TripAdvisor review of his workhouse be like? What if Frodo had used Google Maps to help him get to Mordor? Original story via Flipsnack, reproduced at the request and with the permission of the artists. Matt Lindley is a content strategist who’s involved in coming up with digital creative campaigns. Jazmin Batisti is a graphic designer from Buenos Aires. They are both currently based in London. Do you love international YA literature? Kiwis do it just as well! Since Eleanor Catton won the Man Booker Prize for The Luminaries, people have become more aware of the quality of our local fiction. Which is amazing. But did you know that our YA fiction is of the same quality as much that is produced overseas? No? Well let me educate you about a few of our top YA novelists writing right now. First of all – trilogies and series’. Internationally, trends have driven our teens through magical boarding schools (Harry Potter), paranormal and vampires (Twilight), dystopias (The Hunger Games), and extreme political situations (Divergent). Note that not only did these trilogies sell incredibly high volumes, they have also become films. Let me begin with one of my favourites. Fleur Beale wrote an incredible trilogy from 2008, beginning with Juno of Taris, about the life of a girl who was born into an isolated island community. This community is under a bubble, to protect them from the environment which they are led to believe by their ruling elders has been polluted to unliveable standards. The book questions the accepted, it has a gutsy heroine, and it has just a glimmer of magic to boot. The three books are Juno of Taris, Fierce September, and Heart of Darkness (all published by Random House). If you want magical realism (think Patrick Ness, Philip Pullman, Margaret Mahy), you cannot go past Dreamhunter / Dreamquake by Elizabeth Knox. The world of Southland draws you in, and makes you feel like anything is possible. I remember reading this for the first time, and wishing so much that I was reading it aged 13 or 14, simply to be closer to what I was like then, ready to believe that dreams were catchable, that magic was real. This has more recently been supplemented with Mortal Fire (Gecko Press), which is itself due a sequel one day! Mandy Hager writes trilogies and stand-alone books with equal aplomb. The trilogy that comes to mind as an excellent dystopia based on an extreme political situation, is ‘The Blood of the Lamb’ series. Composed of The Crossing, Into the Wilderness, and Resurrection, the trilogy is prefaced on a ‘last survivor’ cult that operates from a ship in the Pacific Ocean. The storyline covers racial inequality, political persecution, and other broad dystopian themes. It is hard-hitting, and wonderfully written. In terms of stand-alone, issues-based novels, there are few hotter right now than John Green. With his abilities on social media, and his hard-hitting topics, he is a hard one to beat. But I would say that there are several of our very own authors who come close. For instance, David Hill. One of David Hill’s first massive publishing successes (in 1992) was See Ya, Simon, in which the narrator’s best friend is a boy with muscular dystrophy, who doesn’t have long to live. This book was picked up around the world, and has been translated into many languages. David has written around 30 YA titles, all with strong believable characters, dealing with recognisable teenage emotions and dramas. (Others I would recommend are Duet, and My Brother’s War). Mandy Hager also comes to mind when thinking about health issues, with books like The Nature of Ash, which sees a teenage boy struggling with caring for his Downs Syndrome-suffering brother, while navigating the apocalypse. More recently, Dear Vincent, deals head-on with death of a sibling; as does Anna Mackenzie’s The Shadow of the Mountain. Let me also mention Kate De Goldi, with her crossover award-winner The 10pm Question. Also Penelope Todd, with the trilogy Watermark (still available in e-book format), which itself is faintly reminiscent of something more otherworldly, classic children’s trilogy The Halfmen of O, by Maurice Gee. While on the topic of Gee, let me just recommend the Salt Trilogy – it is rather wonderful. Can you tell how much I love kiwi dystopian YA trilogies? The YA section of the New Zealand Children’s and Young Adults’ Book awards is always strong, and I always wonder how the judges can possibly choose a winner. This year, Karen Healey was one of the contenders. Healey is somebody you cannot fail to mention while discussing and recommending current kiwi YA fiction. 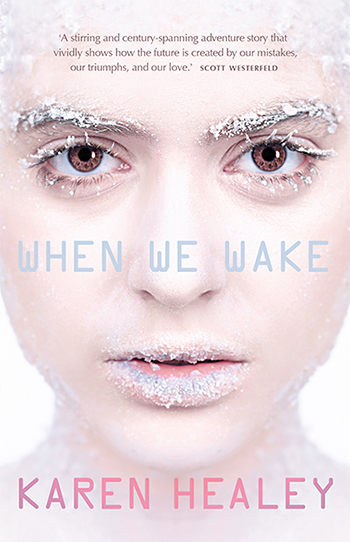 Author of four books, two of which are part of the When We Wake trilogy, she is one to watch for her very real teenage voices. Pick it up. If you like your YA set in the past, Tania Roxborogh and Anna Mackenzie are both ones to watch. Each have written broadly about teen themes, so they aren’t one-trick ponies, but I would recommend Banquo’s Son and the others in Roxborogh’s trilogy for those who like their teenage problems with a 12th-century dramatic twist; while Mackenzie has two titles in the Cattra’s Legacy trilogy out so far, set in medieval times. For action along the lines of Robert Muchamore’s CHERUB series, but keeping it kiwi, you can’t go far wrong with Brian Falkner. He has been publishing great action books for teens for many years now, and is currently in the midst of a series called Recon Team Angel. One stand-alone that I must recommend, from a few years ago, is Brain Jack. I seem to remember reading it over a few hours when I got my hands on it. Another author to check out both current and past titles of along these lines is Ken Catran – he writes stand-alone books packed with drama and excitement. The wonderful thing about writers of YA in New Zealand is that I haven’t met one I didn’t like. They are humble and generous, while writing these incredible books that transport teenagers all over New Zealand into different worlds. Let’s hope that the melding of Random House and Penguin doesn’t interrupt this incredible industry. Or perhaps it will prompt the creation of a new company: does anybody fancy starting a new publishing house dedicated to good-quality kiwi YA? People I haven’t mentioned, who are also worth looking up (i.e. I think this piece is long enough): Bernard Beckett, Barbara Else, R.L Steadman, David Hair, V. M Jones, Jack Lasenby, Ted Dawe, Joy Cowley, Adele Broadbent, Melinda Szymanik, Alison Robertson, Maryanne Scott, Sherryl Jordan (I loved her writing as a kid), and newcomer Rachael Craw. If there are more I have missed, please add your recommendations in the comments! A book is an obvious choice for a mother’s day gift, and where would we be, the Thursday before Mother’s Day, without a few recommendations. What type of books does your mum read? Maeve Binchy, my Mum enjoys reading from a wide variety of authors but always came back to her one favourite author. What type of books does your mum read? My Mum loves reading self help books. She is a very productive, positive person who enjoys affirmative messages and new ways of looking at the world. What was the last book you gave your mum that she really enjoyed? Gulp, I can’t remember. However the last book she gave me was A Book is A Book (Gecko Press) 9781877579929; a delightful story. She knows I worked as a bookseller for years and so she also paired this present with Weird Things Customers Say in Bookstores, by Jen Campbell (Overlook Press) 9781468301281, which made me hoot with laughter. What do you think she might enjoy this Mother’s Day? I don’t know, but I better go over to Unity and have a look at the psychology section because there are not many days left to get her something. In fact she might enjoy Too Soon Old, Too Late Smart by Gordon Livingston (Hodder Headline) 9780733621482. The title sounds depressing but the book is actually warm, insightful and rather wonderful. also enjoys historical fiction, and true crime non-fiction. If it comes with a conspiracy theory, all the better. What was the last book you gave your mum that she really enjoyed? She enjoyed The Luminaries, by Eleanor Catton when I passed on my copy last year. She also enjoyed The Casual Vacancy, by J K Rowling. What type of books does your mum (wife) read? What was the last book you gave your mum that she really enjoyed? I gave my mother The Game of Kings, by Dorothy Dunnett (Penguin) 9780140282399, a swashbuckling authentic historical drama set in 1500’s Scotland. What do you think she might enjoy this Mother’s Day? I know she’s been interested in The Empress Dowager Cixi, by Jung Chang (Jonathon Cape Ltd) 9780224087445 which combines truth, history, and a wonderful cultural angle. She’d probably love that for Mother’s Day. Vote for your favourite below and we’ll announce which book we’ll be reading over summer on Thursday, 13 December. To make it easy there’s only two choices.